It’s Homespun’s special Japanese January issue – on sale January 9, and it’s full of charming projects and ideas that bring the East to Western crafters and stitchers. 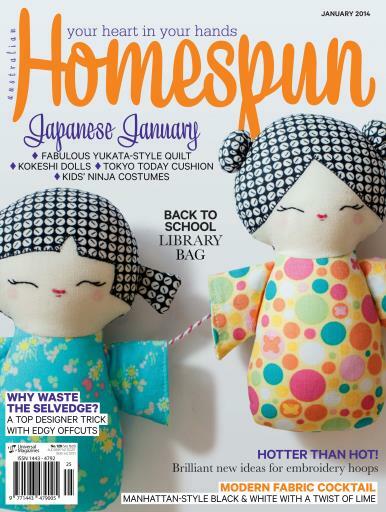 Drawing on Japanese tradition, Homespun brings you a glorious yukata-style quilt, a charming swag of Kokeshi dolls (you’ll see a couple on the cover), a Tokyo Today cushion and some fun Ninja costumes for your kids. 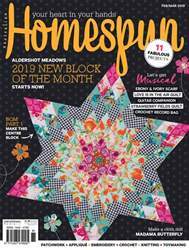 Closer to home, there’s a beach bag to knit, a Little Miss Muffet doll, an easy ribboned tablecloth and back-to-school owl library bag to stitch, not to mention the glorious quilts on offer. 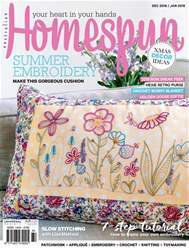 There’s also a roundup of some sensational ideas for embroidery-hoops projects and a great way to use up fabric selvedges. For fabric shoppers, Homespun turns to graphic black and white with a shot of lime. 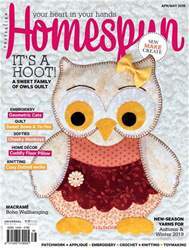 All the best for holiday stitching in January Homespun.